To reconfigure settings, press Reset. To copy by specifying the color, image quality, density, etc. To use the Keypad, slide the Control Panel to the left. If the [10 Keypad] is assigned to the Register key, pressing the Register key enables you to display the Keypad on the Touch Panel to enter data. To retype the number of copies, press C (Clear). The original is scanned and copy begins. 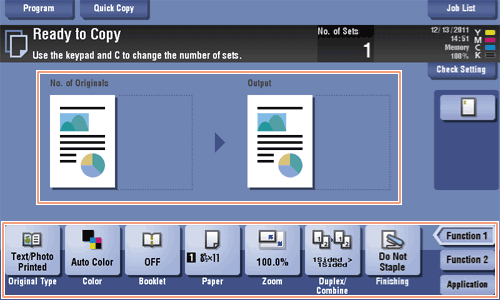 If you press the Stop key while scanning or printing an original, processing is stopped, and a list of inactive jobs is displayed. To perform processing again, delete the inactive jobs from the list.